Glimpses of a project I've been working on . . . I have seen this project grow page by page, watching you work day after day, sometimes from sundown until the sky is pink again in the east. And I am always amazed at how you talk dragon flies into posing under the mica, until you're ready to move on to someing else, and then release them. The man in the front office adjacent to the kitchen. PS Atticus dropped a tennis ball into the spittoon in my office. I believe he want to see what would happen. Yup!! He was....BUT It's okay, it's your office mate and love!! Your book pages are looking filled with natures goodness. REALLY great! Love the dragon fly & the turkey feather!! Your Leslie avitar and Atticus is looking really nice too! Brilliant way to secure a feather! 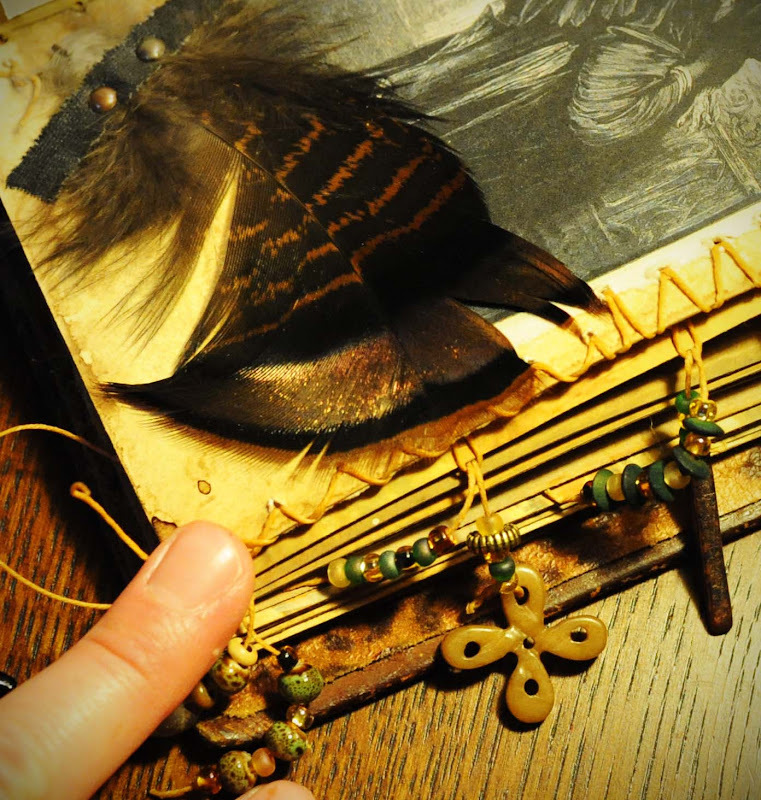 I am always reluctant to add feathers if I have to 'hurt' them to make them stay put. Mica--another brilliant lesson you taught me. When I get back home, I will try to remember that. I left on vacay with -0- art tools save for my camera. Talking about discipline! But the power of the photo will prevail! Hope we are able to meet this month! Will keep in touch! Wonderful as always and the way you photograph takes my breath away. Just gorgeous, Leslie! Loved them! delicious and wonderful detail cannot wait to see the finished piece! just beautiful - so rich! Fantastic and brilliant journal details..
this is utterly gorgeous! i could stare at these two photos for hours. 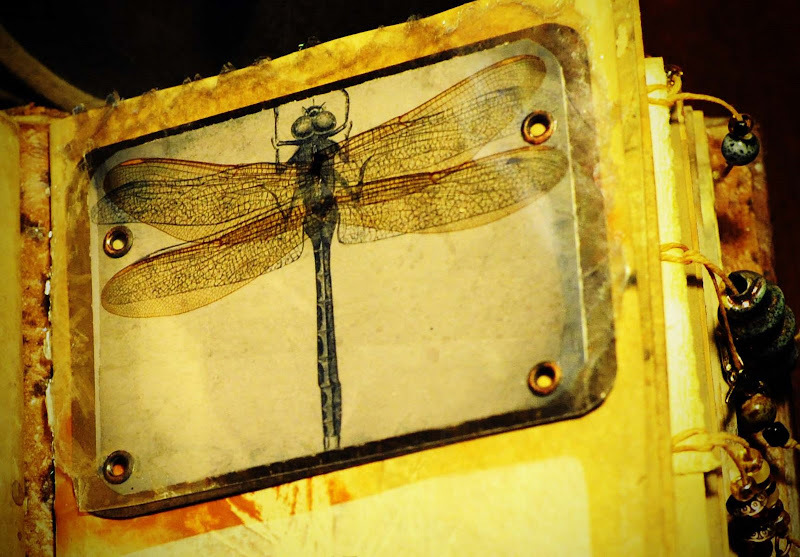 dragonflies are one of my favorite things and yours is divine! i can't wait to see more of this beautiful book! I just love glimpses of things!!! Beautiful Leslie. I'm lovin Jacks comments BTW. Sensational!! Just wish I could hold it in my hands!!! What a gorgeous looking book... do we get to see more of it? Love the new banner... just an unbelievable pair!